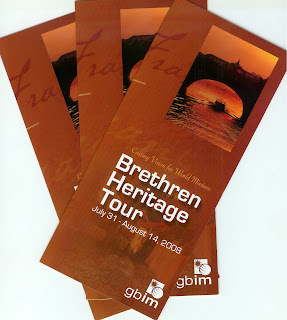 Brochures and information packets are now available for the “Brethren Heritage Tour,” to take place July 31-August 14, 2008, immediately following the igo08 national conference in Tampa, Florida. Organized by Grace Brethren International Missions, the tour will be hosted by Dr. David Plaster, a seasoned European traveler and noted scholar of Grace Brethren history. Plaster is senior pastor of the Grace Brethren Church of Columbus in Worthington, Ohio. The first few days of the tour include celebrating the 300th anniversary of the Brethren movement in Schwarzenau, Germany. Hotel accommodations will be in Marburg, Germany, but the Saturday and Sunday activities will be in Schwarzenau, the little hamlet on the Eder River where Alexander Mack and seven other believers baptized each other in 1708 to give birth to what is today the “mother movement” for six or more Brethren groups. Following the 300th anniversary celebrations, the tour will move on to a Rhine River cruise and tours of several cities in Germany, including some time with the Grace Brethren Church in Aalen for an evening get-together. Moving then to France and Switzerland, the tour will include day tours of the Swiss Alps, Sunday worship with the Lyon (France) Grace Brethren Church, and an overnight stay at the Chateau de St. Albain. A tour of Paris will conclude the trip. Space is limited, so it is suggested that reservations be made early. For more information contact Ted Rondeau at Grace Brethren International Missions at trondeau@gbim.org or call (574) 268-1888, ext. 29.